Question. I’m nervous about investing in other countries – especially the US. Every time I turn on the news it feels like something crazy is going on with the stock markets in the US. Last year, I felt like my portfolio was on a roller coaster ride. I’m wondering if I should just keep my investments in Canada instead… Would that be safer? Answer. Indeed, it’s often said that, as an investor, you should “buy what you know.” Sounds safe, and sounds smart. But really, what does the average investor actually know about any of the companies in which they invest? If you hold even just 4 or 5 mutual funds or exchange traded funds (ETFs) in your portfolio, in most cases, you are likely invested in hundreds, and perhaps even more than 1,000 companies. What do you know about any of them? In fact, “buy what you know” can actually be quite dangerous, as it leads many investors to own an extremely narrow portfolio. The dot com days provide us with countless examples of investors who worked in the technology industry, and felt that was an industry they knew and understood well. As such, many not only had their incomes tied to that industry, but also had personally invested in the same stocks in that industry as well. As an aside, I once had an investor tell me how diversified he truly believed he was, because he was invested in dot com, telecom, and technology stocks. Of course, like so many others, he found out the hard way just how narrow and concentrated his portfolio really was. While it’s not necessarily a good idea to invest in only what you know, it is generally a good idea to invest in what you understand. That is, it’s important that you understand not only the investment itself, but also the role of each investment in your portfolio, at your own level of experience. These days, there are a plethora of investment products available with countless bells and whistles. Option-based non-principal protected notes, synthetic collateralized debt obligations, triple leveraged inverse exchange traded funds, etc. Most products such as these are ridiculously complicated, and completely unnecessary for most investors. If you’re ever presented with investment solutions that you can’t even understand, just ask yourself, “Can I achieve my goals without the use of products like these?” Inevitably, you’ll find that, while complex investment products may sound appealing and sophisticated, they often aren’t suitable, and aren’t necessary for you to achieve your investment goals. Let’s get back to the question of investing in Canada. One of the most common investment traps, based along the theme of “buy what you know,” is known as home bias, or home country bias. The gist of it is this: Many investors overweight their portfolios with investments of their country of residence, because the familiar seems less risky. That is, as investors, we are naturally biased towards holding investments in our home country. This isn’t unique to Canada, and can be observed in most other countries as well. However, in a country like Canada, home bias be very risky for a couple of reasons in particular. First, in the context of global markets, the Canadian market is actually tiny. Canada comprises less than 4% of the global equity market. Yet, according to a study by Vanguard, Canadians hold, on average, about 60% of the equity portion of their portfolios exclusively in Canadian stocks. Essentially, investing solely in Canada means ignoring more than 96% of the opportunities available global equity markets. Second, and perhaps more importantly, the Canadian stock market is very concentrated in a few industry sectors, and very deficient in others. For example, financials account for over 35% of the entire Canadian stock market. Energy accounts for over 23%. Those two sectors completely dominate the Canadian stock market, and comprise over half the entire market. On the other hand, industries such as healthcare, information technology, utilities, and telecommunications are almost non-existent in Canada. In fact, those four industries combined account for only about 10% of the entire Canadian equity market. In other words, investing primarily in Canada, leads to an inefficient portfolio that lacks exposure to some very important industry sectors, and is entirely overweight in others. The net result is that, such a portfolio is more risky, and more volatile, due to increased concentration in just a few industry sectors. Keep in mind that, while Canada represents less than 4% of the global equity market, the US represents over 40%. That is, the US stock market is more than 10x the size of the Canadian market. 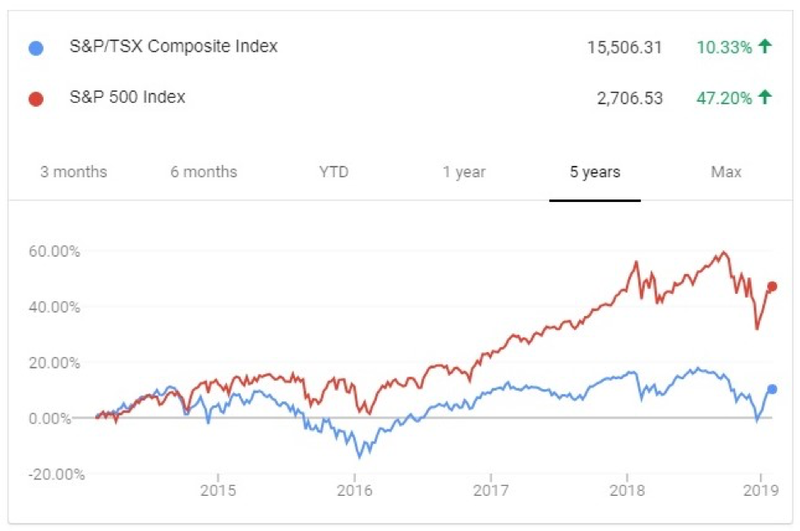 Let’s take a look at how the US and Canadian stock markets have performed over the last 5 years. As we can see from the graph below, the return of US market is almost 5x that of the Canadian market. While the TSX has return just barely over 10%, the US market has returned over 47%. That’s a whopping difference. Regardless of how safe Canadian investments may make you feel, missing out on the gains from the US market in recent years has been a very costly mistake for Canadian investors falling victim to home bias. So, should you load up on the US instead? No. Because over the next 5 years, the charts might be the opposite, with Canada outperforming. Despite many claims to the contrary, there simply is no crystal ball, and it is entirely unknown as to how Canada, or the US, or any other country for that matter, will perform in the coming years. This is why it’s important to maintain an appropriate level of diversification in your portfolio at all times, and avoid gambling on the expected performance of one country versus another. 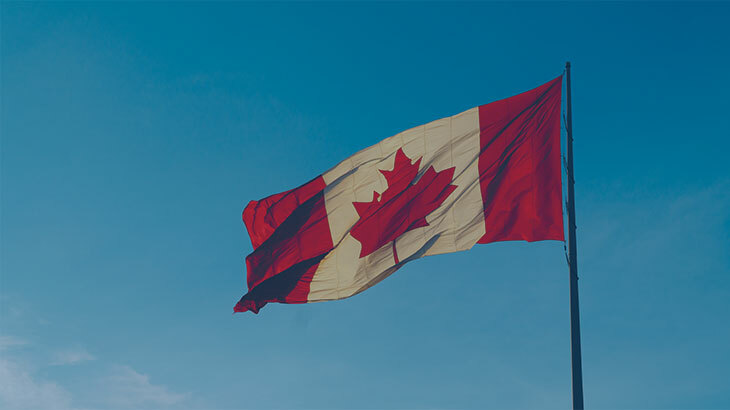 Although many investors hold some foreign investments, the truth is that the vast majority of Canadians are significantly overweight in Canadian stocks. Why? If investing solely in Canada is so counter-productive, why do so many investors continue to do it? Likely, the main factors are a preference for the familiar, and a misperception for risk. Ironically, in their attempt to avoid risk by keeping investments “safe at home” here in Canada, investors actually end up increasing risk, and sacrificing return at the same time. At ModernAdvisor, diversification is one of the core principles of our investment philosophy. We ensure that our portfolios are properly diversified – on industry sector, and geography. When you invest with us, you can be assured that your portfolio will not only be properly diversified, but will also be regularly rebalanced, to make sure you maintain adequate diversification at all times. If you’re interested in learning more, or would like to have a discussion with a Portfolio Manager or Certified Financial Planner, just contact us. Investing Home bias, Investing. permalink.